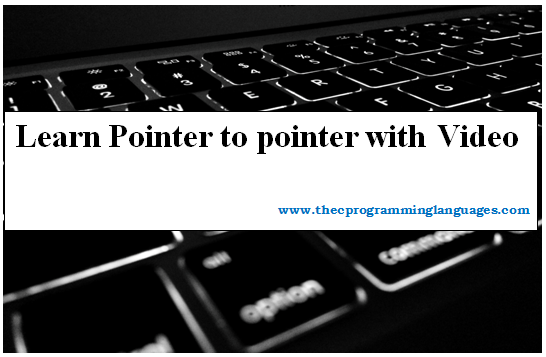 When a pointer variable store address of another pointer variable is known as pointer pointer or pointer to pointer or double pointer in C. First pointer store the address of the variable and second pointer store address of the first pointer. In the above program, the variable 'a' hold the value '10'. Pointer variable 'ptr' hold the address of the variable 'a' that is 26869 and pointer variable 'q' hold the address of pointer variable 'ptr' that is 40000. If we want to access the value of the variable 'a' by pointer variable 'ptr' and 'q' then we using int *ptr and int **q. How int **q; access the value of the variable 'a'? pointer 'q' hold the address of the pointer 'ptr' and pointer 'ptr' hold the address of the variable 'a'.